by Bill Dwight on Wednesday, November 27, 2013 at 4:04 PM | LEAVE A COMMENT! I love taking the occasional trip down memory lane to look over my kids’ transactions from their earliest financial days. 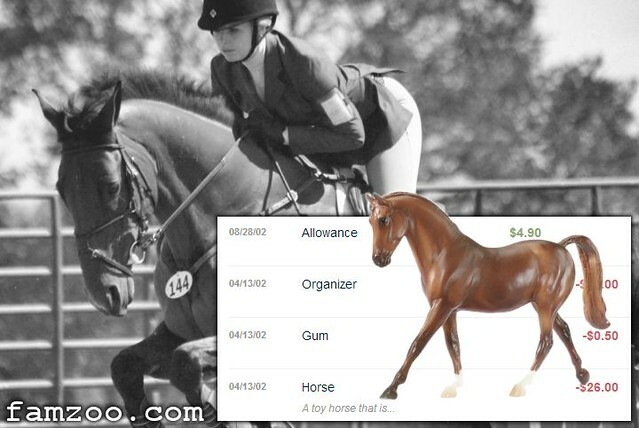 Who knew the $26 toy horse that my then 11 year old daughter bought back on April 13th in 2002 was the precursor to years of competitive riding? And, oh yes, how about the Neiman Marcus iridescent chiffon gown she bought for the high school prom? I told her she’d regret torching her whole clothing budget on that one, but, hey, live and learn! That “go cold turkey on clothing for the rest of the year” experience was way more effective than any parental lecture from an engineer-geek dad, that’s for sure! It’s fun looking back, so I don’t want to lose my precious “financial memory lane” accounts. That said, I don’t want to be tripping over them every time I go into FamZoo either! Fortunately, with the new Account Visibility setting, I don’t have to. All I have to do is edit an account and check the box next to “Hide account from normal view.” That will remove it from everyday pages in FamZoo. The hidden account won’t appear on the Overview page or bank pages like the Accounts listing page. It also won’t appear in typical account pull-down menus like the one at the top of the Transactions listing page. So, how do I get back to my hidden accounts whenever I feel the urge to stroll down memory lane? Go to the Accounts listing page on the bank tab, and look for the “Go To Hidden Accounts” link at the bottom of the page. That will take you to a special page listing all of your hidden accounts. To un-hide an account, just visit the Hidden Accounts listing page, edit the account, and un-check the box in the visibility section. That will restore visibility of the account in the normal bank pages. The young years are fleeting. Cherish those memories!